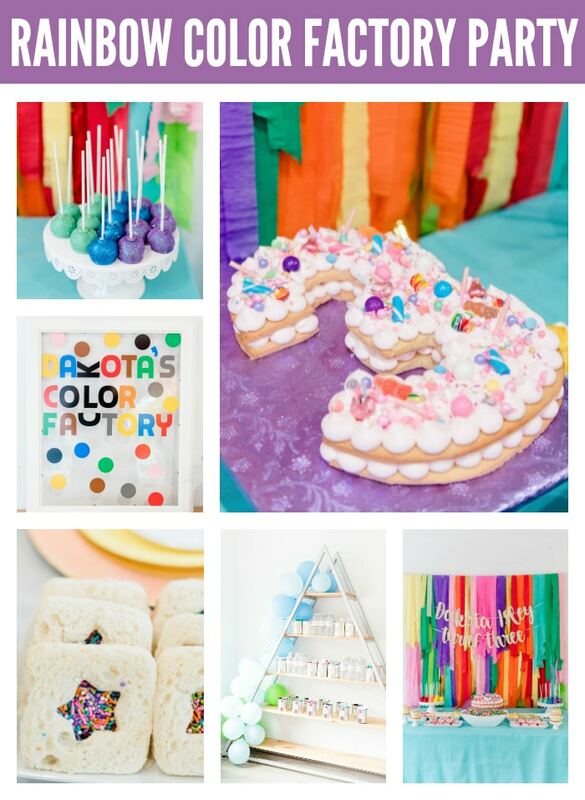 This Rainbow Color Factory Party is one of the most fun party themes we have ever seen! We love the bright colors and decorations! 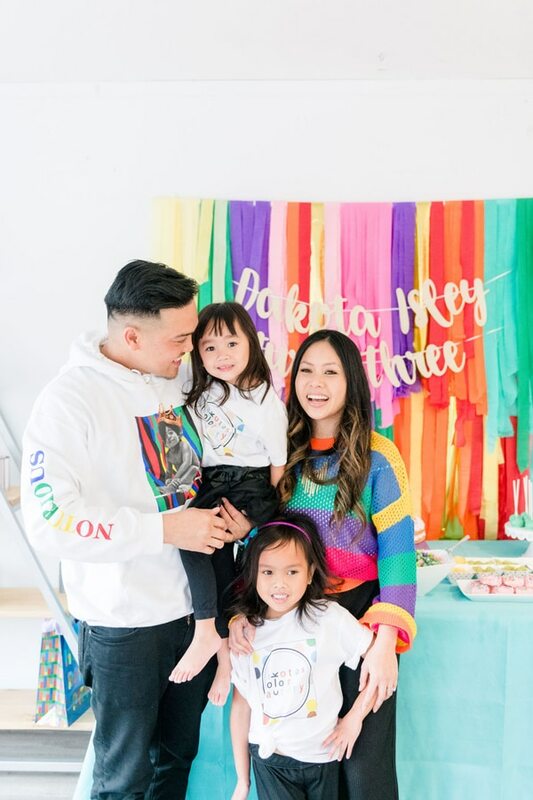 The owner of Mon Amie Harlow threw this amazing Rainbow Color Factory Party for her own daughter and it called for a celebration in a major way! 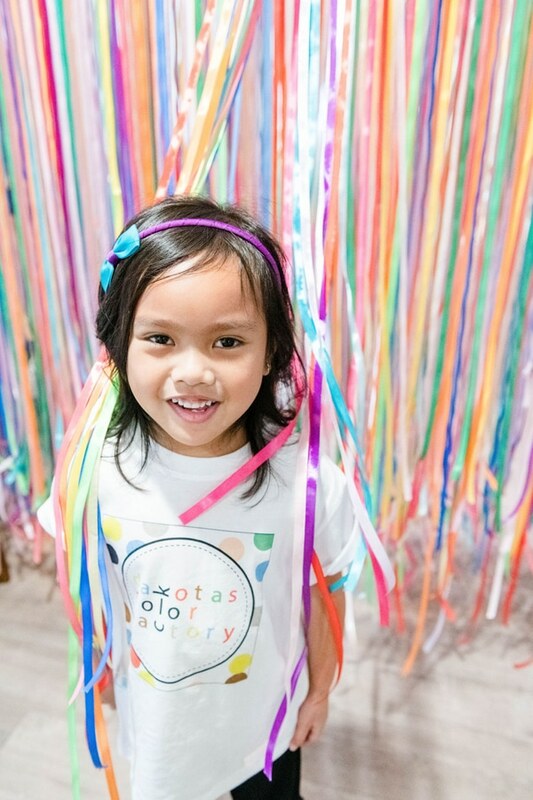 This little girl deserved all the rainbows and desserts her heart desired and Mom went all out spending 34 hours of labor just to complete the ribbons hallway decor! You knew it was going to be an amazing Rainbow Color Factory Party when guests walked in to a 30 foot Rainbow Balloon Arch for an entrance! Amazing! 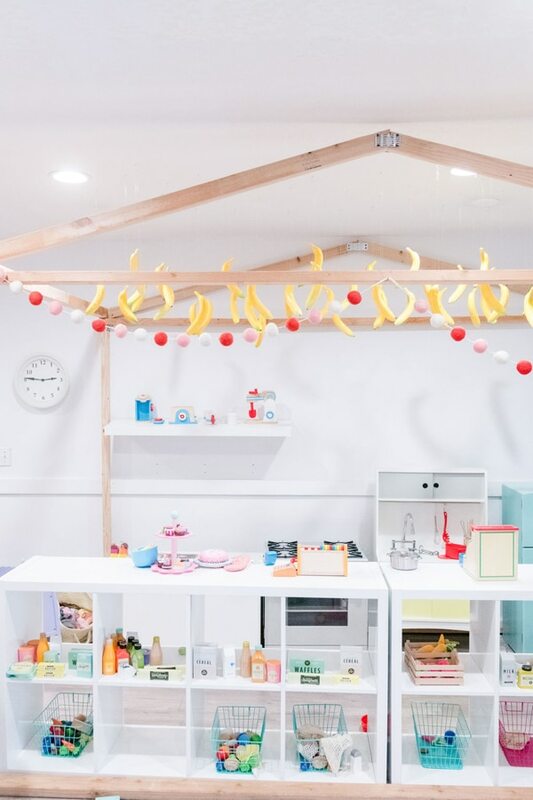 This Rainbow Theme Party was all any little girl could hope for. Just look at those colorful streamers that were found as a backdrop for the dessert table. What more could you ask for besides these gorgeous rainbow tassels?! It’s perfect! All of the Rainbow Party Food, especially these fun desserts, looked absolutely delicious! We just love all of the colors and how everything complimented each other perfectly. 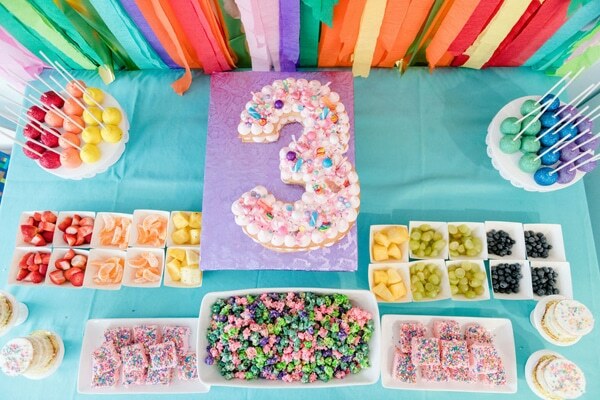 What a fun number cake! 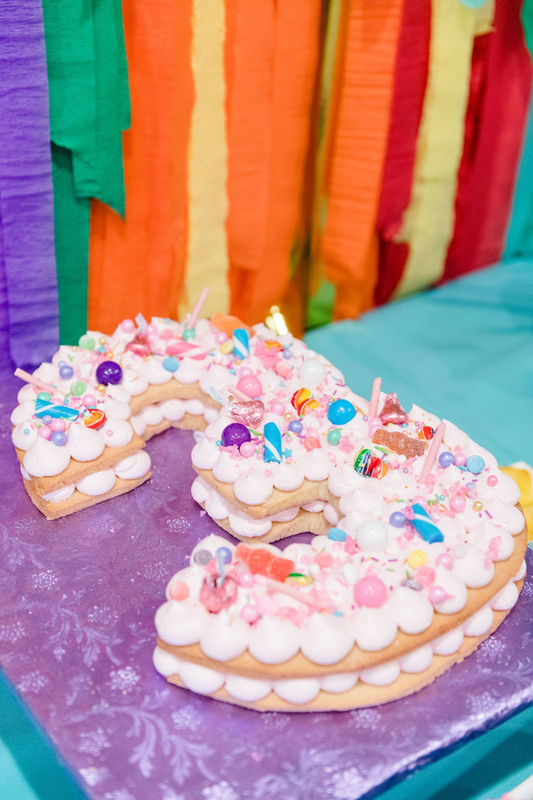 This Candy Confetti Cake is one of the most fun parts of the Rainbow Color Factory Party! Roxy’s Sweet Treats did an amazing job on this unique cake, as well as on all of the desserts at the Color Factory Party. They all turned out perfect and everyone couldn’t wait to dig in to all of the fun treats! 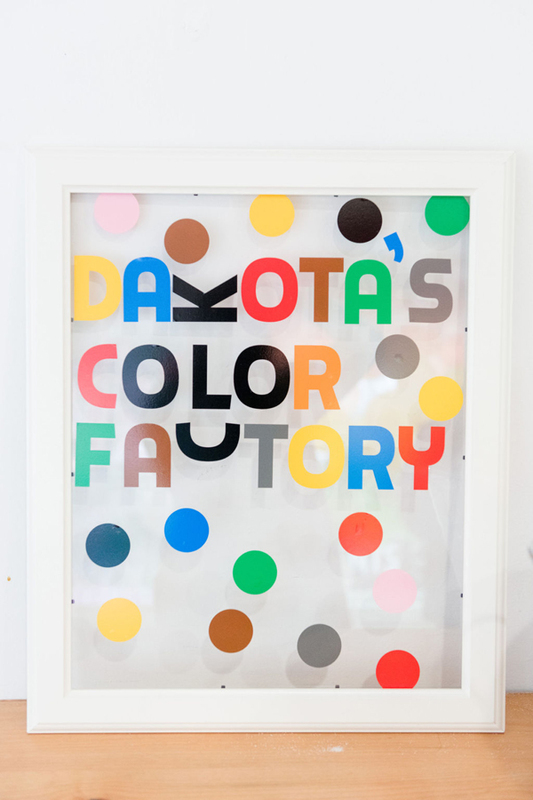 Dakota’s Color Factory Signage was absolutely on-point! 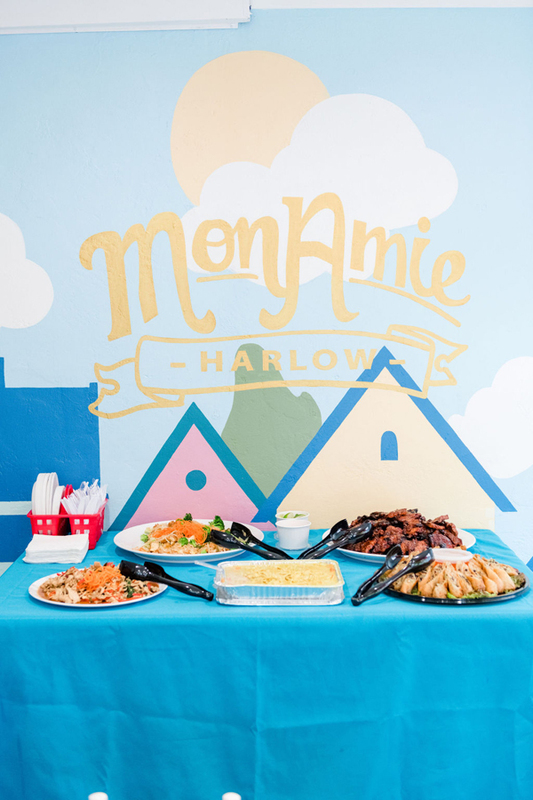 All of the Rainbow Party Decorations that were found around the birthday party were great and mom went all out to make sure that Mon Amie Harlow created the perfect Rainbow Color Factory Party for her little girl! 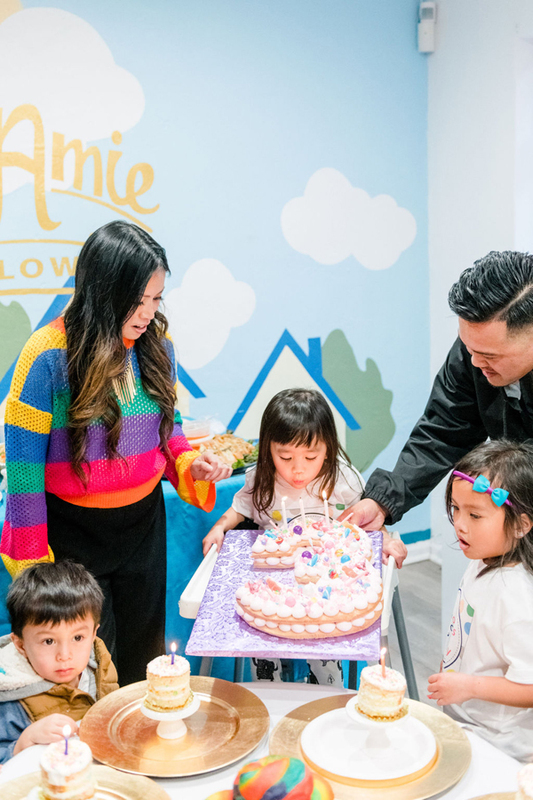 A special treat that all 25 little guests enjoyed was their very own 3-layered mini cake, which was complete with a candle to blow out during the Happy Birthday song! You can see them above on their own mini-pedestal cake stands and all of the little birthday guests couldn’t wait to dig in. How fun! 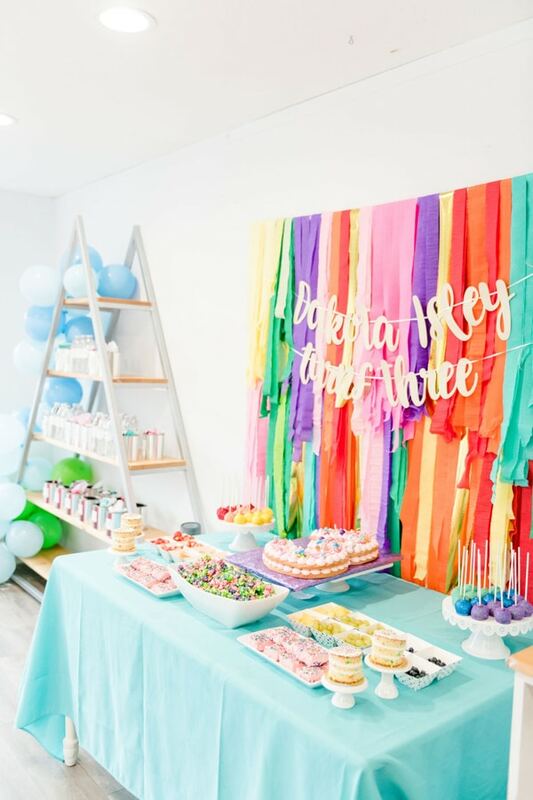 There are so many great Rainbow Color Factory Party Ideas at this celebration and we love all of them! This table set-up for all of the guests is one great example! 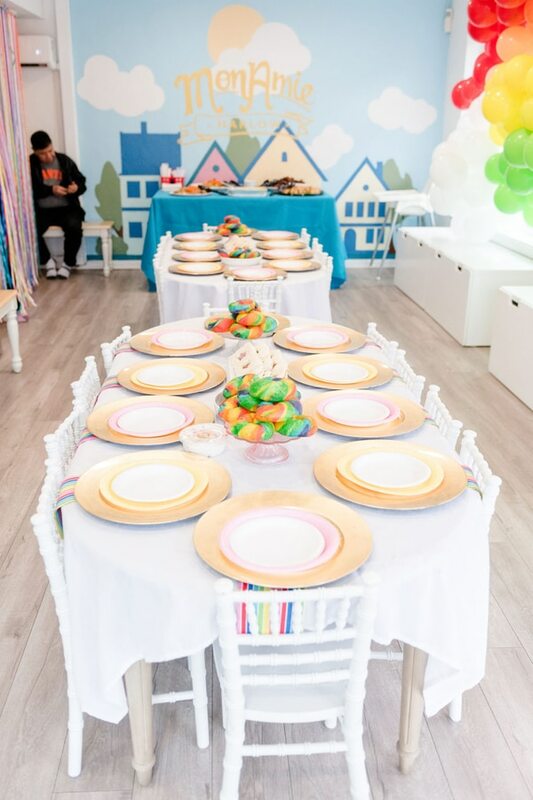 Because of all of the rainbow colors that were found around the birthday party, we think it was a great idea to keep all of the tablecloths and chairs simply white. What a great contrast! 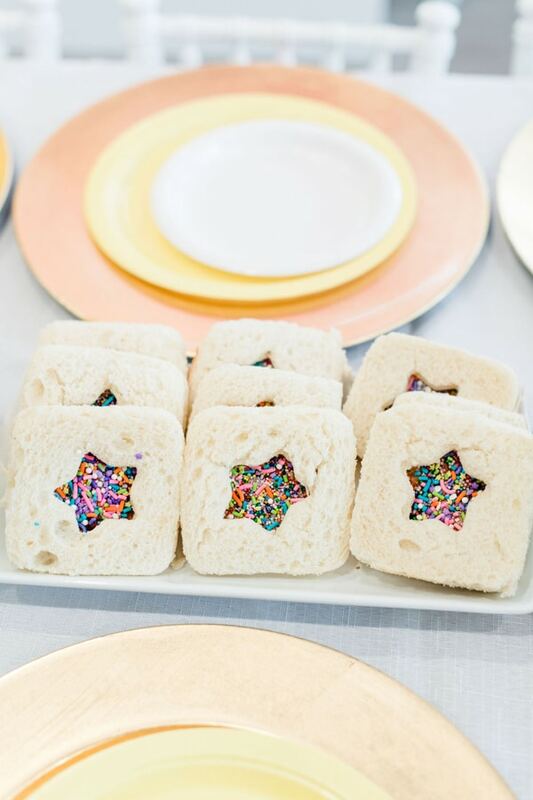 How amazing are these Cut-out Star Sprinkle Cookies?! We’ve never seen anything like them and we are absolutely in love! 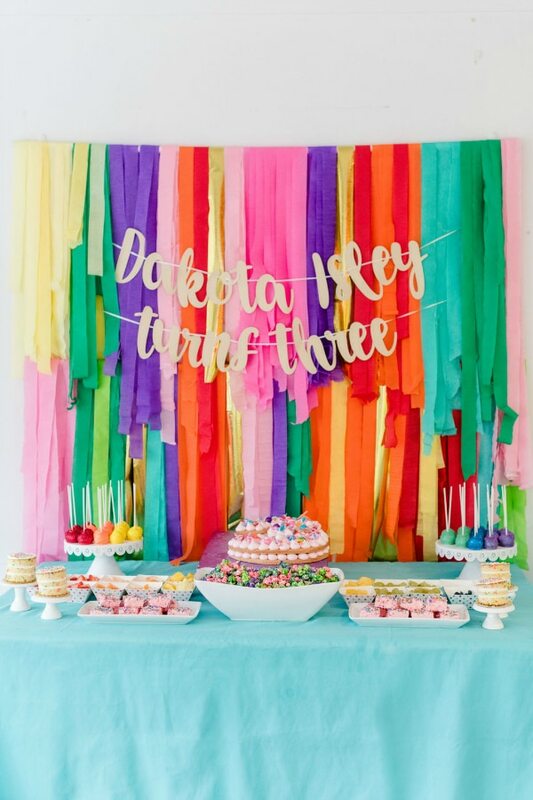 We just love all of these Rainbow Party Ideas and they are so much fun! 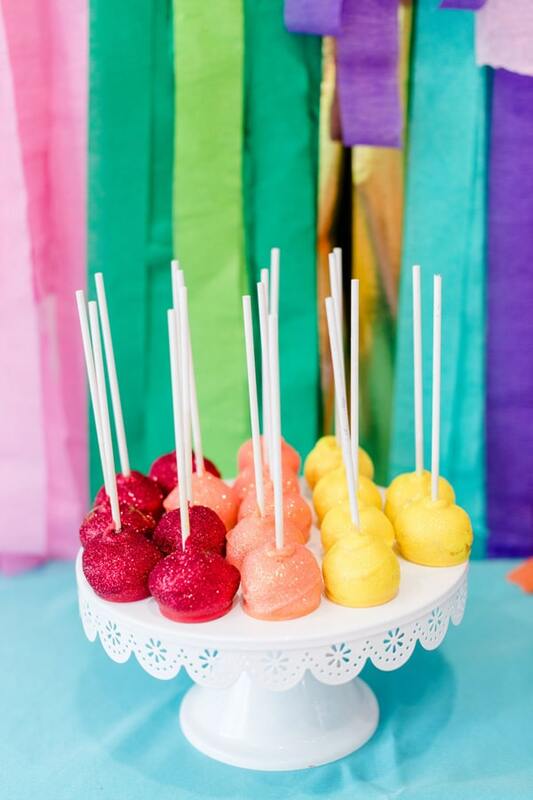 OK, how amazing are these Rainbow Glitter Cake Pops?! Of course, there were two trays of them available for all of the party guests, for the “warm” colors and the “cool” colors. 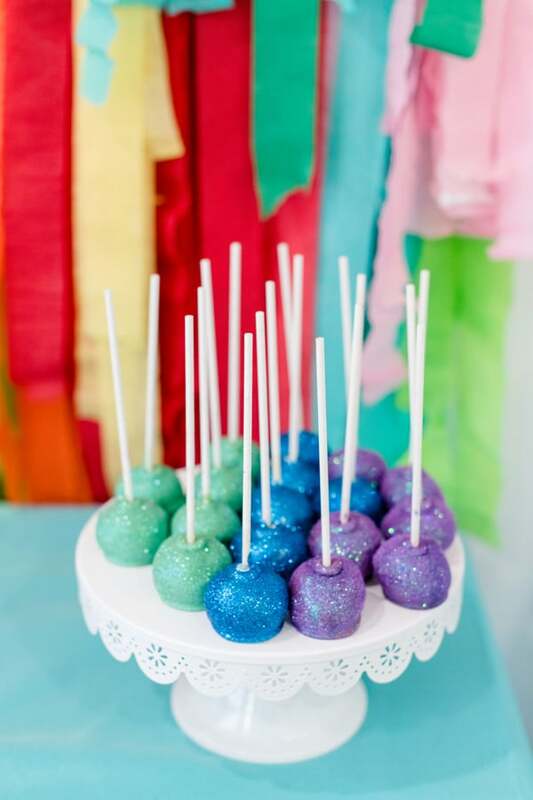 Talk about the perfect dessert addition for a Rainbow Color Factory Party! And who could ignore the glitter, because… GLITTER! More colors were available on the other side of the Rainbow Color Factory Party dessert table, so everyone was able to pick their favorite color cake pops. So fun! Rainbow fruit cups were available for all of the Rainbow Color Factory Birthday Party guests to enjoy. 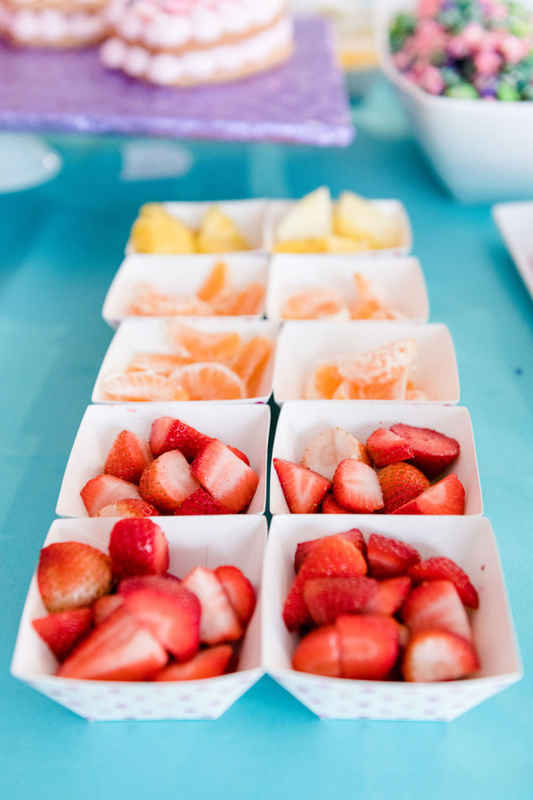 We love how something as simple as fruit could be divided out in fruit cups to showcase the colors of the rainbow. What a simple but great idea! Coup de Thai provided all of the food for the Rainbow Color Factory Party and everyone couldn’t stop talking about their food. What a great variety of food for a fun rainbow party! 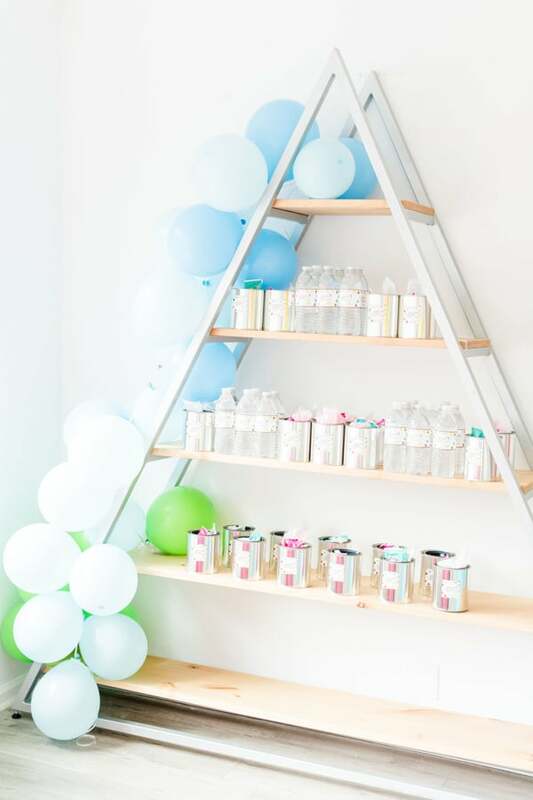 Additional Rainbow Party Ideas were found around the venue, such as this triangle favor shelf with the fun balloon installation. All of the party favors were found on the shelves, along with water bottles that had personalized labels on them. Rainbow Party Supplies were in full force! Rainbow Party Decorations were perfectly placed from one end of the party to another! We just love it! 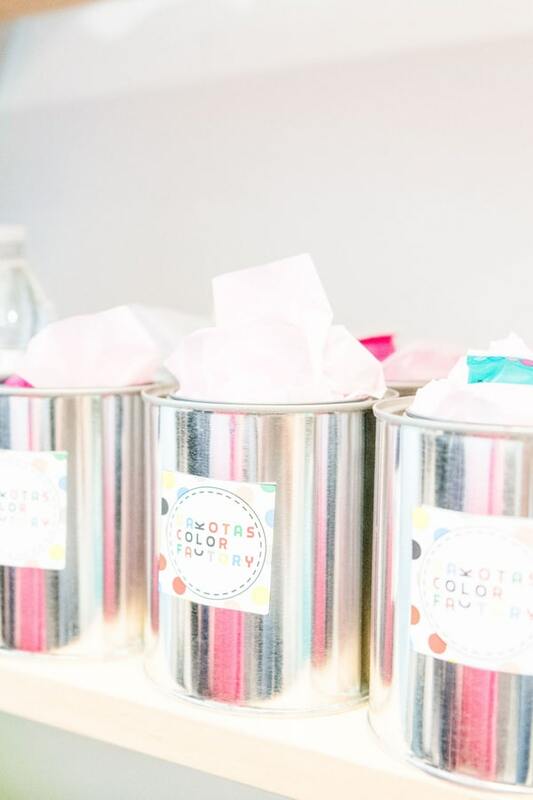 Paint tin cans were used as party favors for the Rainbow Color Factory Party and included lots of fun goodies inside. All of the little party guests couldn’t wait to get their hands on them! There were even bananas hanging from the ceiling in one part of the party venue! Fun was to be had in every single corner! 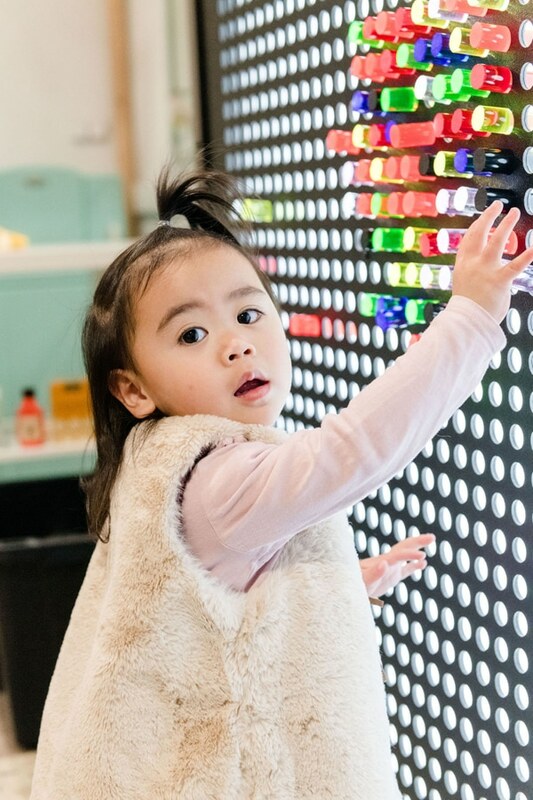 A 6 foot Lite-Bright was available for the little ones to play with in the Silver Disco Room. The kiddos had so much fun during the Rainbow Color Factory Party playing with all of the goodies that were at their fingertips! There was a fun ballpit for everyone to play in, as well. Who doesn’t love a fun ballpit, which of course, was filled with RAINBOW balls to jump around in! 5,000 streamers were found from the ceiling to the floor for the littles to jump through, as well. They couldn’t get enough! 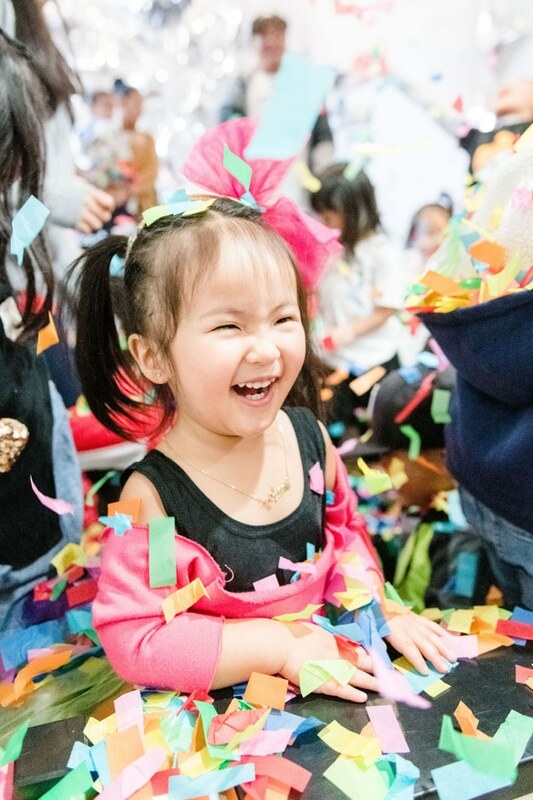 Who wouldn’t love having the fun of a confetti room to play in during the Rainbow Color Factory Party?! This little one sure loved it! Blowing out the candles of the special Candy Confetti Cake was a highlight for this birthday girl! And everyone couldn’t wait to be involved by blowing out their own birthday cake candle, as well! Everyone and I mean EVERYONE had a blast! What’s your favorite details in this Rainbow Color Factory Party? Let us know in the comments below.